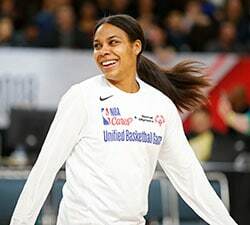 Players attending WNBA Draft 2019 presented by State Farm react to being selected. Q: What do you think you can bring to the Las Vegas Aces organization? Young: I think as a big guard, I’m very versatile, can get to the basket, rebound, play defense. I’m really excited to get drafted to the Aces and I’m looking forward to it. Q: Can you describe the type of emotions you are feeling right now after being drafted No. 1 overall? Young: Honestly, I can’t. It’s something that I dreamed of as a little kid. To be able to achieve it today, it’s an amazing feeling. I just have to give all credit to God. Q: This could be a Notre Dame night with your four other starters potentially being drafted. How special is it to be at the top of your class in being drafted tonight? Young: That would be great. This is what we all dreamed of since we were little kids and to have five from Notre Dame would be amazing. Q: What does it mean to you to be the top pick? Young: It means the world to me. This is what I worked for my whole life. You always dream of being the first pick but to actually be able to achieve, that is just crazy. Q: What does it mean to be drafted No. 2 by the Liberty? Durr: It feels great to be drafted by the Liberty. They’re a great organization with a great coach. Obviously it was her first year, this past season, but I’m so grateful and thankful for this opportunity. Q: Is there anything special or have you thought much about playing in New York? Durr: My mom is from the Bronx so she always talks about New York but I’m super excited. Q: How does it feel to be playing for a new ownership group and playing some games in Brooklyn? Durr: I’m excited, that’s awesome. I really think that’s a great thing, especially for women’s basketball. I think that’s great. Q: How long have you thought about this moment and being one of the top draft picks? Durr: Oh man, I think I was sitting in my mom’s womb dreaming about this moment. I think that’s why I couldn’t talk to Holly Rowe, I was in shock. I was about to cry, and I don’t cry. This is a dream come true and I can’t thank God enough. Q: What do you think your biggest adjustment will be playing in the WNBA? Durr: I would probably say playing 2-3 games per week, gaining more weight and getting stronger. Q: The chance to play for Indiana and be a rim protector for Pokey [Chatman], have you thought about how great a fit you will be for that team? McCowan: Yes, it’s nothing more than what I have been doing at [Mississippi] State. I rebound, block shots and put up whatever shots my teammates give me, so I think going there will be great. Q: What are your expectations coming into this season? McCowan: Whatever my coaches give me, I will fulfill those roles. No matter what it is, I’m not going to ask why or how, I’m just going to get it done. Q: How does it feel when your name was actually called? What was going through your mind? McCowan: I just blanked out. I knew I was going third overall and I would play with my old teammate. It was a great feeling. Q: When you got to Mississippi State did you think you would end up here? McCowan: No. Me being my old self I would look back and say I wouldn’t be this successful but I’m proud of myself for maturing and putting in the hard work that I have. Q: What’s going to be the biggest thing that you’re going to need to work on in the future to contribute? Samuelson: I think making sure that I can be accountable for my team on defense. I think that’s a big weakness for me and learning how to use my length to help that. Q: How did it feel to get drafted? Samuelson: I’m excited. I’m kind of shocked and super happy to just get this opportunity. Q: How significant is it that Chicago’s play is something similar to what you’re used to? Last name: Huge. I think for me I’m going in ready to learn and get as much done as I can. I’m going to work as hard as I can to see if I can make an impact. Like you said, the style of play is something I’m used to. Q: Napheesa Collier said she was looking forward to playing against you. Are you looking forward to that? How much have you thought about that? Samuelson: Absolutely. I’m so excited. Now, I know for sure that I’m playing against her. I’m excited to get that opportunity and we’ll see what happens. Q: How does it feel to be drafted by Dallas? Ogunbowale: Dallas is a great place and I’m really excited. They have a great coach and I’m ready to get started. Q: How cool is it to be a part of a Notre Dame group that could have five players drafted? Ogunbowale: It’s amazing. We really left a mark on Notre Dame and that’s a credit to the coaching staff. They recruit great players and develop us over the years to become what it is now and I’m just thankful for that. Q: Can you talk about your style of play and what you think you can bring to Dallas? Ogunbowale: Excitement, some playmaking abilities, getting to the basket, pull-up threes and whatever they need. Just passion for the game. Q: Can you talk about the opportunity to play with a fellow Irish in Skylar Diggins? Ogunbowale: That’s amazing. 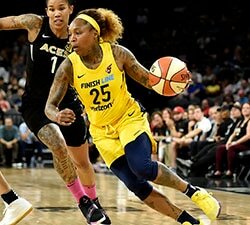 A lot of people who don’t know a lot about basketball always ask me ‘Have you played with Skylar?’ She’s such a big name. I was too young to play with her but to actually be able to play with her at some pint will be an amazing feeling. Q: How has Coach Auriemma prepared you for this moment? Collier: He is such an amazing coach. You have all these high expectations going in because of the legacy he has there. He exceeded all of my expectations. I wouldn’t be the player that I am today with him and our coaching staff. 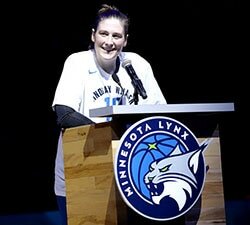 Q: How does it feel to be drafted by Cheryl Reeve and the Minnesota Lynx? Collier: I’m really excited. I got to play with her at USA Basketball for a little. I’m so excited to get there with those players and that coaching staff. Q: How does it feel to play with Maya Moore next season? Collier: It’s going to be amazing. That’s been my dream since I started watching her when I was little. So, to know she’s a part of that team, that means a lot. Q: What was your reaction when you heard your name called? Collier: I was really excited. I’m so excited to play with this team. I love the coaching staff and the players. I’m excited to get down there. What have the last 72 hours been like? Q: Brown: It’s been a dream come true. A tiring dream come true. Coming off the national championship, it was a quick turnaround to come back here, but it was a dream come true. It was all worth it honestly. Q: How is going to be playing with players like Candace Parker and Nneka Ogwumike? Brown: I’m going to try not to be star-struck. I grew up watching up them. I’m just going to do what I can and whatever I can. Just help my team and be me. Q: Are you excited to play in LA? Brown: Yes, LA is great. I’m definitely shocked and so excited. Q: What’s going to be the hardest part about leaving Baylor? Brown: Definitely leaving my teammates. I know they’re watching and excited. Definitely leaving my teammates. I love those girls. They’re like my sisters. Q: How excited are you to go play under Sandy Brondello? Smith: I’m so excited. I’ve played under Sandy before with the Australian team so I know how she operates. I have a really good relationship with her. I can’t think of anywhere else I’d want to go. Q: How do you feel your game translates to the WNBA? Smith: I think I’m a long, versatile player. I’ve got height. I can shoot from the outside. I can rebound. I’m willing to work hard. Whatever role they need me to play, I’m there to do it and do it at 100 percent. Q: Did grow up following Penny Taylor? Smith: Yeah, I grew up watching Penny. My dad was telling me a story about how he used to play and practice against her and that she was just an absolute killer. It’s great that I get to go to the same place where she’s played as well. Q: You come in as an elite rebounder and this is a team that led the league in rebounding percentage last season. Does this feel like it was meant to be? Anigwe: This whole experience is so unreal. I feel very confident in my rebounding ability, and to be at this level, the Sun trusting and believing in me to draft me, I can’t put it into words. Q: What was this day like from picking out your outfit and getting ready? Anigwe: This whole entire day was unreal. They had us doing makeup, I don’t usually wear makeup but I got used to it and being around these beautiful young ladies built a lot of confidence in myself. My mom chose my outfit. It’s been great, I have a lot of family and friends here so I’m excited. Q: How excited are you to have the chance to play in a high-octane offense like Phoenix? 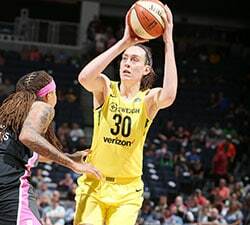 Cunningham: I think just soaking up the sponge from Diana Taurasi is going to be awesome. I think she’s a beast. We’re both hard-nosed so I’m really excited to get out there. Q: Do you see a lot of parallels between the type of game you have and the type she has? Cunningham: Absolutely. She got a lot of flak for it when she was younger. I’m kind of following in her footsteps. I really am so excited to get out there. Q: Have you ever played with a post presence like Brittney Griner? Cunningham: No, but I’m looking forward to it. I’ve always wanted to. I really am so excited for Brittney and Taurasi. Just to be a sponge and soak up their greatness and see what I can learn. Q: What part of the WNBA are you most excited about? Cunningham: I’m just excited to learn. I’m excited to have a growth mindset and learn from the greats. I’m just going to go out there. Taurasi has that toughness and I think the two of us together will be great. Q: What are your plans for coming to the league? Xu: I think I will play this year. Q: You’re the first player that attended the NBA Academy to be drafted. What does that mean to you? Xu: I hope that I can inspire others and give courage to others to pursue their dreams. Q: How does it feel to play in New York City? Xu: It feels good to be playing here in the big city. I went to camp here last year.